Few people run Python programs by double clicking the .py file as if it were a .exe file. When a typical user (non-programmer types) double clicks an exe file, they expect it to pop open with a window they can interact with. While GUIs, using tkinter, are possible using standard Python installations, it's unlikely many programs do this. What if it were easy so to open a Python program into a GUI that complete beginners could do it? Would anyone care? Would anyone use it? It's difficult to answer because to date it's not been "easy" to build a custom GUI. There seems to be a gap in the ability to add a GUI onto a Python program/script. Complete beginners are left using only the command line and many advanced programmers don't want to take the time required to code up a tkinter GUI. The problem is that beginners (those with experience of less than 6 weeks) are not capable of learning even the simplest of the major packages. That leaves the wrapper-packages. Users will likely find it difficult or impossible to build a custom GUI layout using the smaller packages. PySimpleGUI attempts to address these GUI challenges by providing a super-simple, easy to understand interface to GUIs that can be easily customized. Complex GUIs are often less than 20 lines of code when PySimpleGUI is used. What makes PySimpleGUI superior for newcomers is that the package contains the majority of the code that the user is normally expected to write. Button callbacks are handled by PySimpleGUI, not the user's code. Beginners struggle to grasp the concept of a function, expecting them to understand a call-back function in the first few weeks is a stretch. With some GUIs arranging the GUI Widgets often requires several lines of code.... at least one or two lines per widget. PySimpleGUI uses an "auto-packer" that creates the layout for the user automatically. There is no concept of a pack nor a grid system needed to layout a GUI Window. 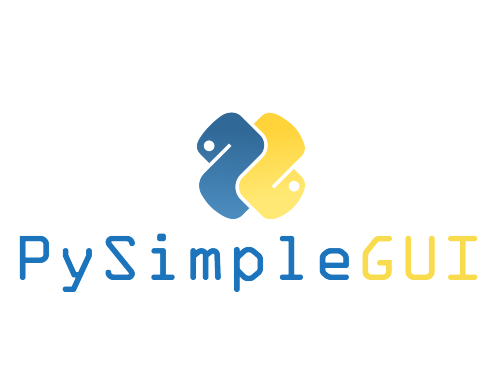 Finally, PySimpleGUI leverages the Python language constructs in clever ways that shortens the amount of code and returns the GUI data in a straightforward manner. 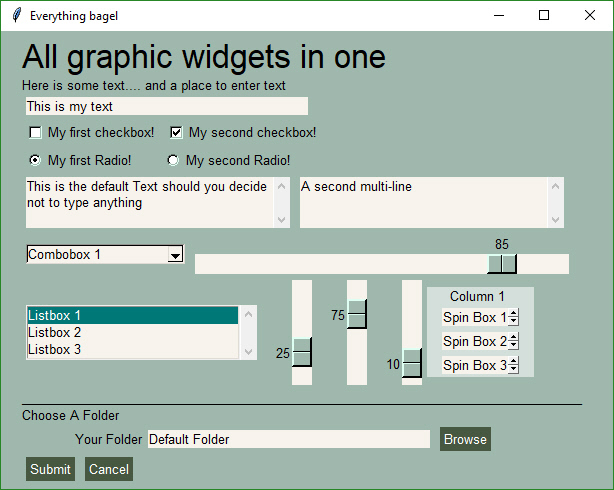 When a Widget is created in a window layout, it is configured in-place, not several lines of code away. Results are returned as a simple list or a dictionary. What's expected from most GUIs is the button that was clicked (OK, cancel, save, yes, no, etc), and the values that were input by the user. The essence of a GUI can be boiled down into a single line of code. This is exactly how PySimpleGUI works (for these simple kinds of GUIs). When the call is made to display the GUI, execution does no return until a button is clicked that closes the window. There are more complex GUIs such as those that don't close after a button is clicked. These resemble a windows program and also be created with PySimpleGUI. A remote control interface for a robot and a chat window are a couple of examples where you want to keep the window open after a button is clicked. When is PySimpleGUI useful? Immediately, anytime you've got a GUI need. It will take under 5 minutes for you to create and try your GUI. With those kinds of times, what do you have to lose trying it? It's a reasonably sized window. If you only need to collect a few values and they're all basically strings, then you would copy this recipe and modify it to suit your needs. The only noticeable difference between PySimpleGUI code running under Python 2.7 and one running on Python 3 is the import statement. Not all GUIs take 5 minutes. Some take 5 lines of code. This is a GUI with a custom layout contained in 5 lines of code. If you find a Recipe similar to your project. You may be able to modify the code within 5 minutes in order to get to your layout, assuming you've got a straightforward layout. Widgets are called Elements in PySimpleGUI. This list of Elements are spelled exactly as you would type it into your Python code. You can also have short-cut Elements. There are 2 types of shortcuts. One is simply other names for the exact same element (e.g. T instead of Text). The second type configures an Element with particular setting, sparing the programmer from specifying all of the parameters (e.g. Submit is a button with the text "Submit" on it). These are line for line what you see in design pattern above. To create your custom GUI, first break your window down into "rows". You'll be defining your window one row at a time. Then for each for, you'll be placing one Element after another, working from left to right. Once you have your layout complete and you've copied over the lines of code that setup and show the window, it's time to look at how to display the window and get the values from the user. First get a window and display it. Checkbox Elements return a value of True/False. Because these checkboxes defaulted to unchecked, the values returned were both False. Once you have the values from the GUI it would be nice to check what values are in the variables. Rather than print them out using a print statement, let's stick with the GUI idea and output to a window. PySimpleGUI has a number of Popup Windows to choose from. The data passed to the Popup will be displayed in a window. The function takes any number of arguments, just like a print call would. Simply pass in all the variables you would like to see in the call. Now that you know the basics, let's put together a window that contains as many PySimpleGUI's elements as possible. Also, just to give it a nice look, we'll change the "look and feel" to a green and tan color scheme. That may seem like a lot of code, but try coding this same GUI layout using any other GUI framework and it will be lengthier and what you see here.... by a WIDE margin. 10's of times longer. Take a moment and pair up the results values with the GUI to get an understanding of how results are created and returned. If you have a script that uses the command line, you don't have to abandon it in order to add a GUI. An easy solution is that if there are zero parameters given on the command line, then the GUI is run. Otherwise, execute the command line as you do today. Have some fun! Spice up the scripts you're tired of running by hand. Spend 5 or 10 minutes playing with the demo scripts. You may find one already exists that does exactly what you need. If not, you will find it's 'simple' to create your own. If you really get lost, you've only invested 10 minutes.